Although Edward S. Curtis and Richard Throssel are perhaps the best known of the men with cameras, many lesser-knowns also toted their picture machines into Indian territory. This exceptional gallery shares some of those old and rare photos with you. 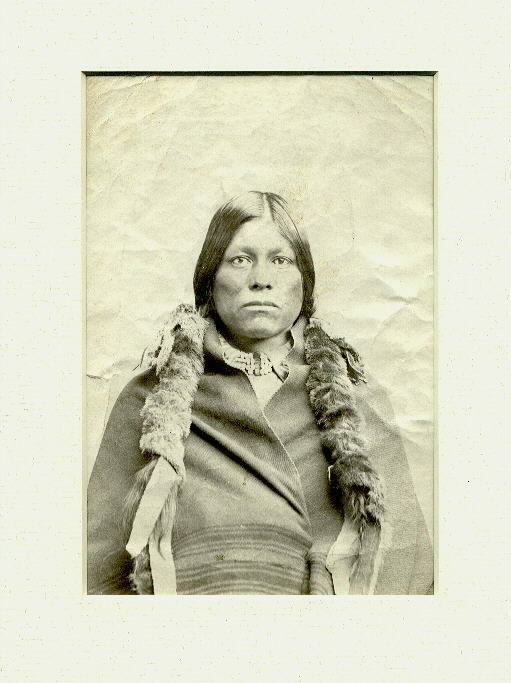 These images are provided to Native American Images by Old West 1873. Click on the thumbnails to see a full sized image of these great historic photos. 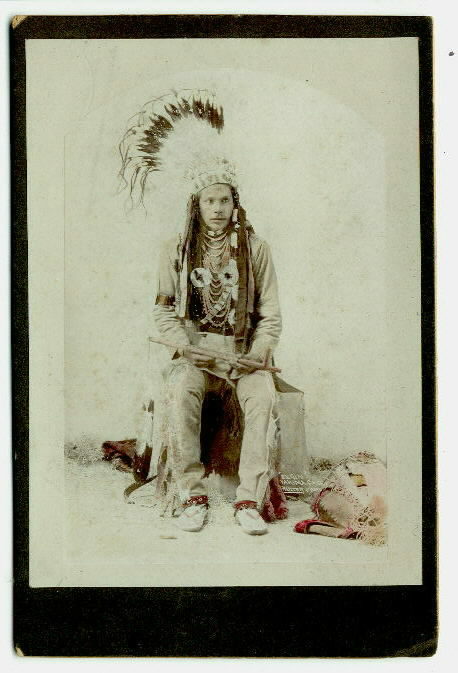 An old cabinet card of an Indian chief wearing a feathered head dress, large breast plate and holding a piece pipe. He wears beaded moccasins and a quiver is near his feet. This one was slightly tinted. 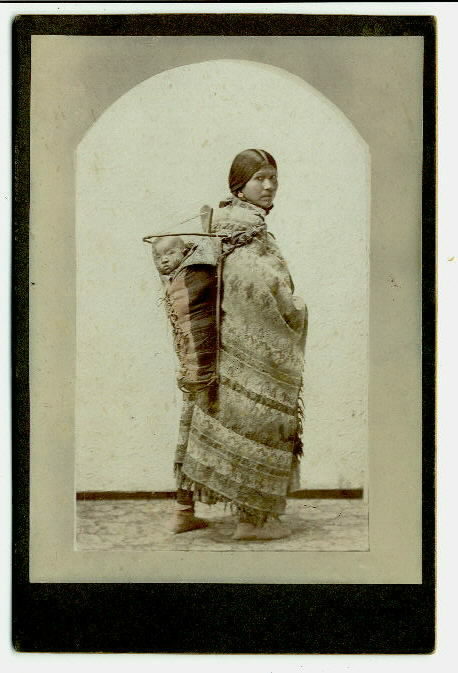 Here an Indian woman who carries her baby on a cradleboard. She wears a blanket. This old cabinet card also was slightly tinted. 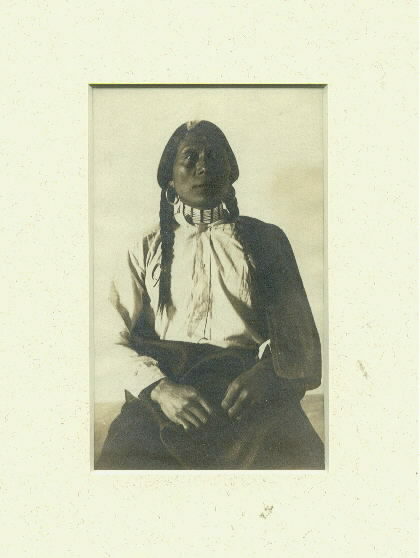 This is an exceptionally rare photo of a young Apache man that was taken by F.A. Hartwell who lived in Arizona Territory. Another image created by F.A. 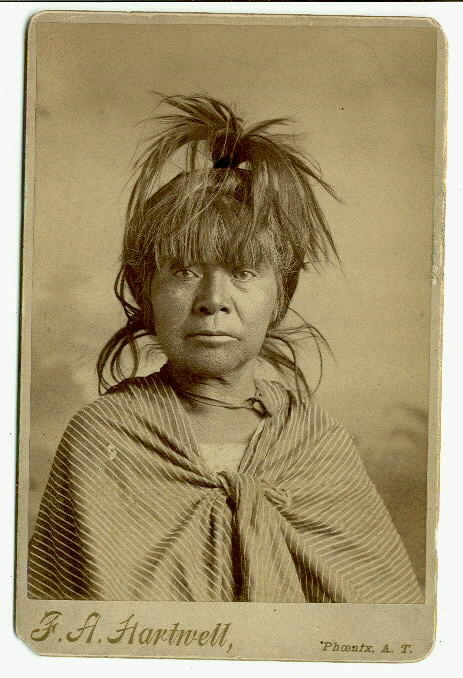 is of an Apache woman who wears a shawl. 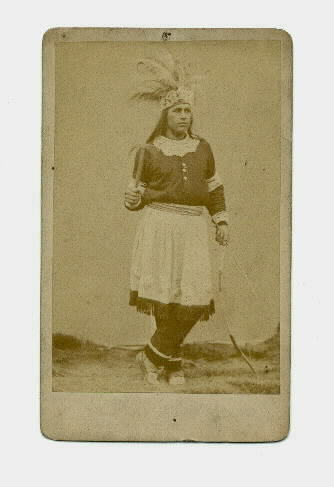 An 1860's silver print has a Native American man posing with a tomahawk in one hand and a bow in the other. 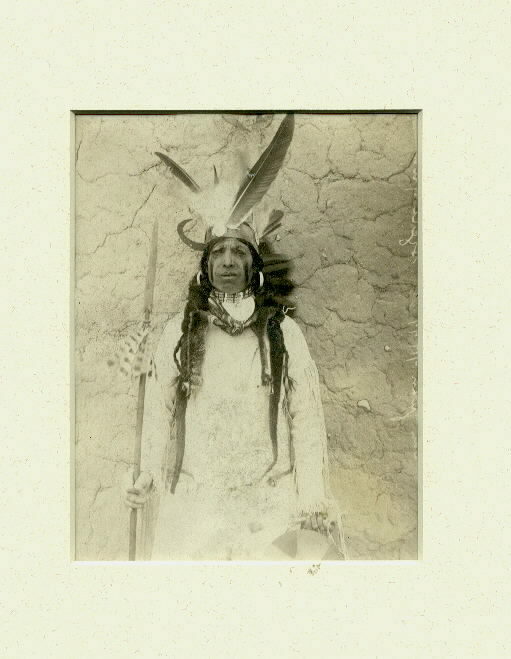 This image is a silver print taken around 1900 showing a Chief wearing a pipe bone choker and a blanket over his shoulders. 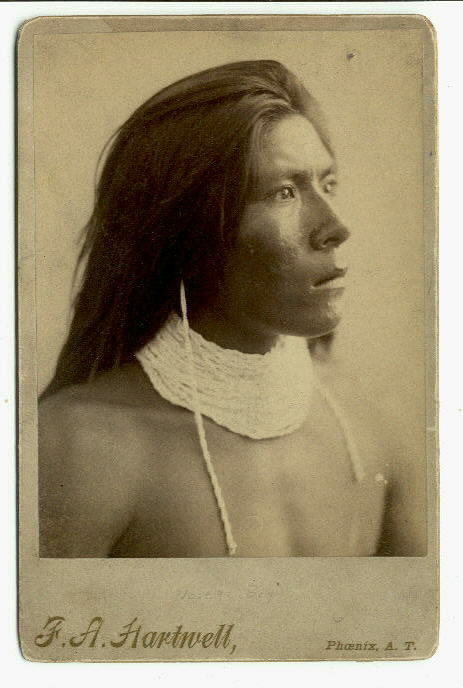 Another image from around 1900 is of an Indian man. He wears traditional braids wrapped in fur with a blanket for warmth. 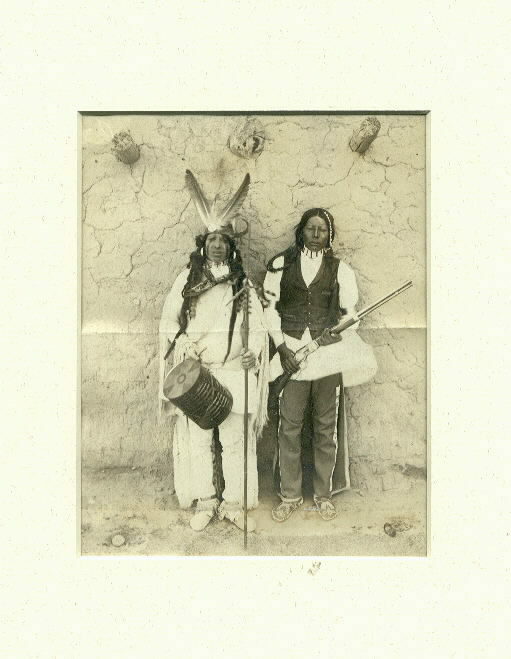 Two Native American men pose next to an Adobe in this silver print from 1900. One holds a rifle, the other a drum. In another silver print from the same era, the man wears a feathered head dress and holds a lance and a shield. 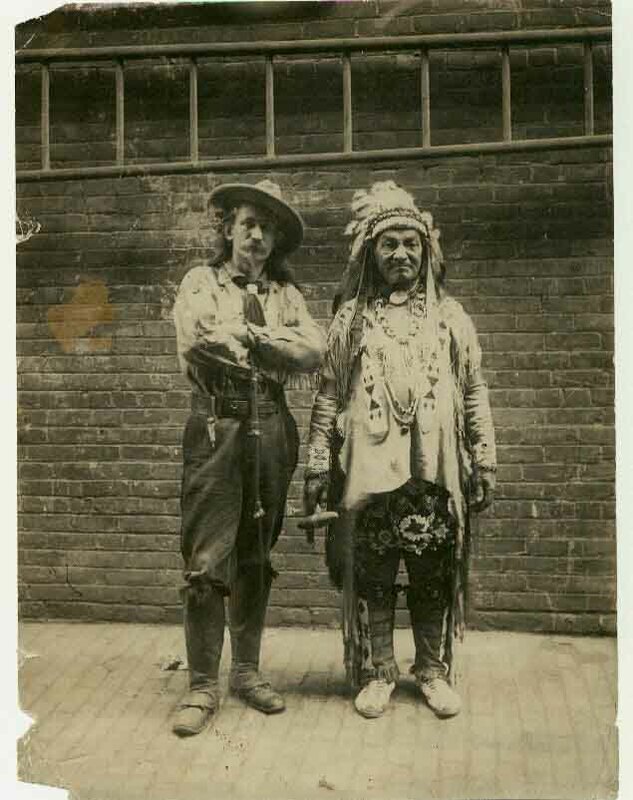 Wild West shows with cowboys and Indians were very t the turn of the 19th century. This image is called "The Indian and the Scout." Both of these fellows were part of the Wild West show.